I love the idea of publishing collections of books. They do a lot of things simultaneously. Even if a buyer/supporter isn’t into everything the publisher is doing, they are more likely to find something they like and want to support. Collections give publishers a way to deliver on a specific aesthetic choice or unifying theme while publishing a larger body of work. I think all of the work in the 2017 Collection is worth your attention; the creators involved in this project have done amazing work in the past. Kelly Kwang’s issue of Frontier is a real treat, Liz Suburbia’s work is consistently amazing (Sacred Heart was one of my favorite books last year), and Jessi Zabarsky’s Witchlight has been a not so secret favorite of mine over the past two years – it’s one of my first purchases at any convention where Jessi and I are both in attendance. project, which went live on Kickstarter this morning. honestly, and without cynicism (which isn’t a useful defense anymore for me). i want) to this collection? (after privately plotting for how long before that). So it’s been in the works! working up to doing a big project with them both. going to be a part of your publishing strategy moving forward? works, and it just seemed like the perfect goal for a campaign. 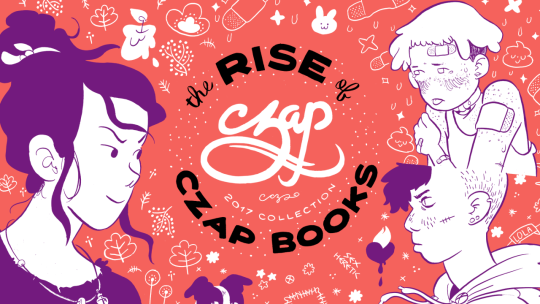 The Czap Books 2017 Collection Kickstarter Page is at this link, if you are interested in learning more. growth of the medium. Please let me know if you have any questions.